It’s nice to hold your art in your hands. 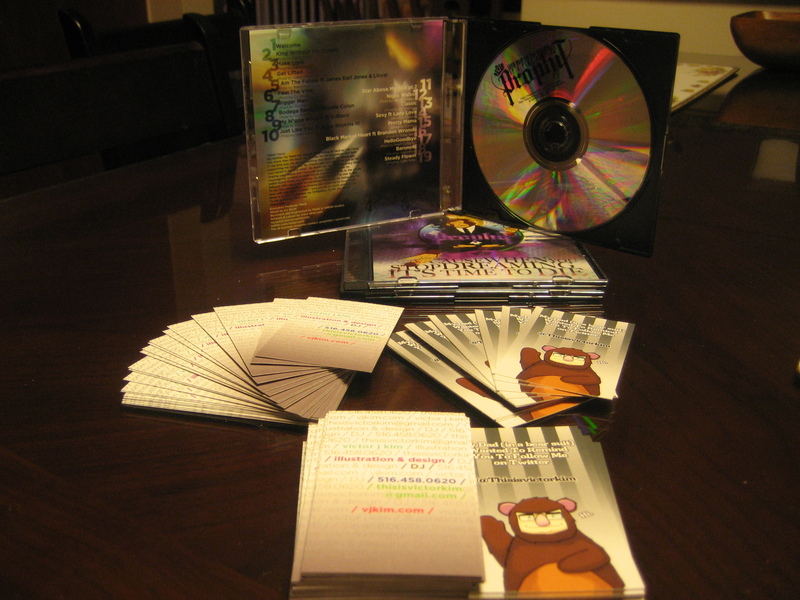 Just got my hands on a few copies of Prophit’s mixtape. If you’re a fan of hip-hop I’d definitely recommend clicking on that link and downloading the mixtape for FREE. I also received my business cards in the mail. I used 4over.com for the printing, they did a great job and were much cheaper than other websites that I’ve used without losing any quality. Here’s an animated preview of what the final version of Prophit‘s cover will look like. Coloring is finished, just gotta layout type for the actual cover now. Took a break from the project from my last post to fully focus on the cover for Prophit‘s upcoming mixtape entitled “Cause When You Stop Dreaming, It’s Time to Die”. I’ve had the absolute privilege to listen to the cuts from this album, and I must say that when this drops on July 28th, y’all better listen up. This kid’s got major talent and there is some major talent working alongside him on this project. Here’s a small preview (not unlike the small rough edits of the songs I got from Prophit) of the cover.